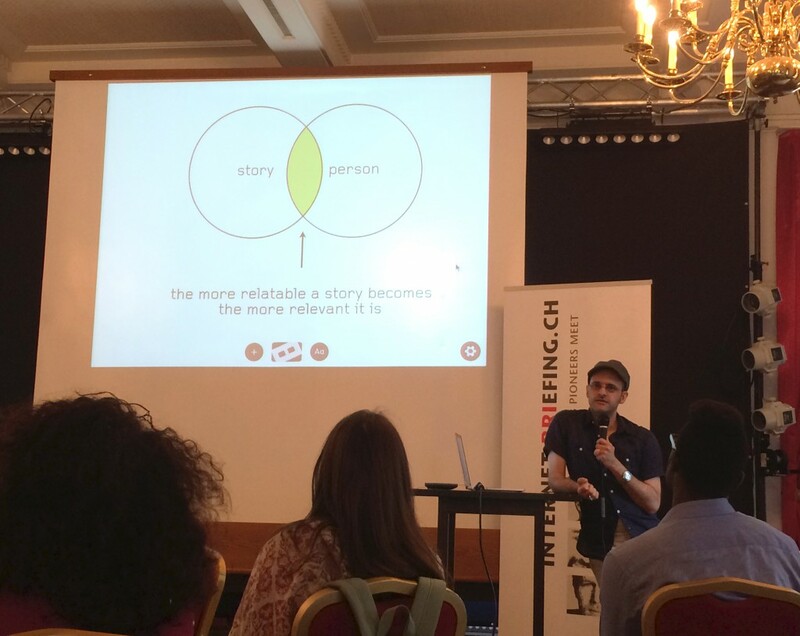 Alain Leclerc von Bonin, our Head of Design, was invited to speak about Dynamic Storytelling at the last Internet Briefing in Zurich. In light of this event, we snapped up opportunity to chat with him afterwards. In a nutshell: What was the content of your talk? My talk was about how to improve the relevance of stories whether this is in presentations or corporate communication. I did this by presenting various narrative forms that can all be associated with Dynamic Storytelling. How would you define Dynamic Storytelling? And why is it important? The major characteristic of Dynamic Storytelling is not having a fixed narration in advance. It is a common known fact, that the content of a presentation or a story in general is only relevant if the audience can relate to it. This is also why many big Hollywood movies start with showing the hero as an ordinary person, so people can identify themselves with him or her. But since people belong to various cultures and have different ways of life, a lot of stories only appeal to certain groups and disregard many others. This is especially true for what I call fixed medium like movies and books where you cannot change the course of the story. With interactive media it is now possible to tell stories dynamically, meaning the narration does not need to be fixed in advance anymore. Therefore the story can be adapted according to each context and the questions and feedback from the audience. So how did you manage to give your speech in a dynamic way then? I prepared a collection of different topics in dizmoSpace: text snippets, info-graphics, interactive showcases, relative websites and images. Thanks to the zooming interface the order of my slide was not fixed. So I could decide at any point to show more or less of any topic. If I noticed that the audience already knew a topic I would just skip it. Also, when I received in-depth questions I would access the website inside my presentation and show live content. Overall, I could dynamically adapt the flow of my presentation to the interest of the audience and therefore be more relevant for them. How was the feedback from the audience? It was very positive. The audience was keenly interested in the topic, which lead to a lively discussion after the talk. Also, they were impressed by the interactive capabilities of dizmo. What are your personal take-aways? The talk showed me once again that dizmo is a very powerful tool for presenting and engaging with audiences, by adapting the presentation to the people and context. In the discussion after my talk I was also reminded of the very obvious but frequently forgotten fact that before you tell your story you first have to go out into the world of your audience and consider customer and peers to find out who they really are and what is most relevant and inspiring to them.